as S201 but with O scale doors and steps. 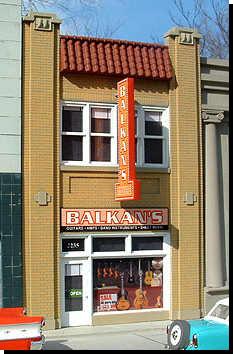 building front redone in white tile. 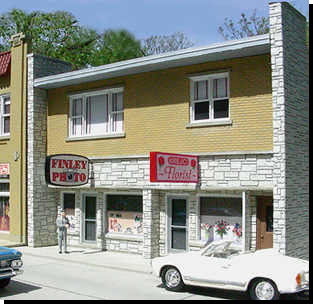 A three-story front modeled after a building in Kankakee IL. Put this little beauty (?) between your better-looking fronts. 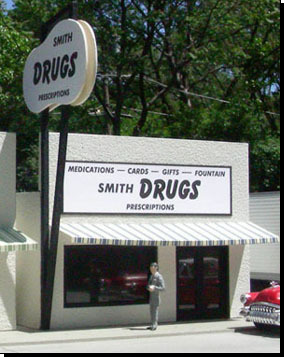 Comes with the hanging sign shown (as a separate piece), and paper signs for making it a drug store, a shoe store or a diner. Also includes paper window blinds and small display window signs. A two-story front with a nouveau flavor. Comes with the hanging sign shown (as a separate piece), and paper signs for two different music stores or a shoe store. Also includes paper window blinds, and even scale-sized old LP covers! A two-story front that can be made for the 1880's all the way up to present day. It represents a carved wooden front. The "refront" lower story comes as a separate piece that the modeler can substitute for the lower story of the original. 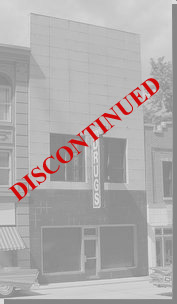 Comes with the hanging sign shown (as a separate piece), and paper signs for two different modern stores or three different old-time stores. Also includes paper window treatments, and a saloon door piece that can replace the cast-in door if the modeler cuts it out (see small picture). Approx. 4"W x 6-3/4"H (3/4" thick at cornice). A two-story front from the 40's-50's is made to represent cut stone! It makes a 2 inch deep relief. Must be assembled with gap-filling CA glue or epoxy. Includes paper window treatments, and signs for four different period stores. Approx. 9-1/2"W x 7"H x 2" D.
A three-story flat with a lot of character for the 20's to the present. Use for your mainline in town, or a backdrop for your yard. Comes with large vent stack, other small vents, conduit, electrical meters, garbage can, box, barrel and stoop. Also includes clear plastic for window panes and some movie and soda posters. Approx. 8-1/8"W x 9-3/4"H x 1/4"D.
Move your family into this attractive 3 story house with deep architectural detail. Close to downtown and public transportation. Your city needs one (or two!) of these. Includes clear plastic for window panes and paper window dressings. Approx. 4-3/4"W x 11-3/4"H x 1/4"D at the wall (7/8" deep cornice, 2-5/8" deep with steps). 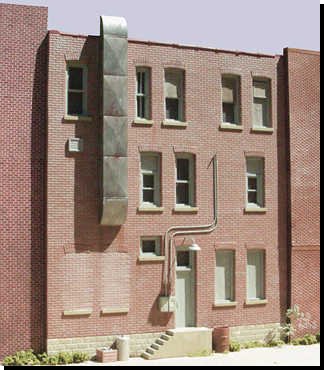 A circa 1910-30 decorative brick front that can be found in almost any US city, suburb or town. Shown with signs for an auto dealer, but includes signs also for an auto repair shop or equipment rental business. I revived the 3" relief idea with this kit: it includes 3" wide side walls and a roof. The roof installs with a slight curve to it. Something else new is that the signs (only the two shown) are pre-cut peel-and-stick, and the sign pieces are cast in dark blue. There is a hanging sign included for the other businesses also but it must be painted. The other signs and window dressings are on paper. Vehicles not included. Approx. 13-1/2"W x 5-5/8"H x 3-3/8"D.
These two kits were copied from HO Ayres kits of the 1950's that were cardboard. They are very simple to build (mitered corners) and include card roof, roof supports, signs shown, chimney and clear plastic for windows. The doors and windows are cast separately for easier painting. The walls represent stucco all the way around. 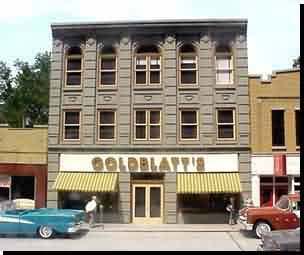 With its small footprint it can fit easily in your main street shopping district, and yet it's large enough to stand on its own. Approx. 6-1/4"D x 5-3/4"W over walls. 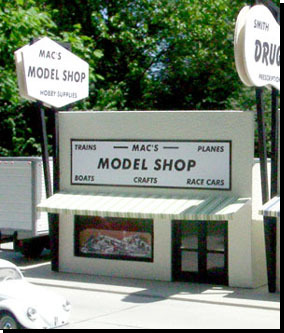 Sister building to the model shop. Same description, different signs and sign post. the etched lettering at the top. 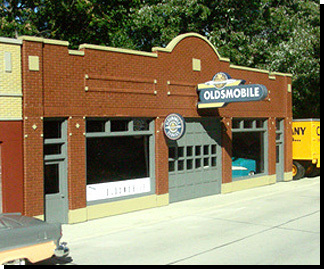 A typical garage from the time when the first cars needed shelter up to the present. Three different large doors are included, and since they're separate the one you choose can be glued open. A 2-flat front that's not too flat! 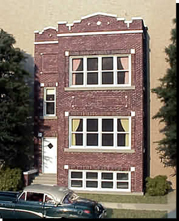 Typical 2-flat with garden apartment from the Chicago suburbs. 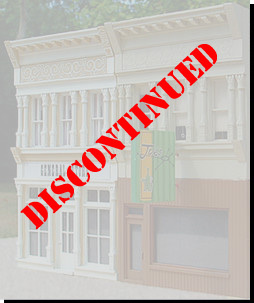 Comes with an alternate front door, roof, clear plastic and paper window treatments. 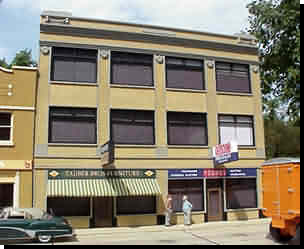 This brick and concrete front is based on a real Sokol building in Berwyn (Chicago suburb). Houses two stores on the street level. Model reflects window replacement probably done in the 70's. Comes with paper signs, paper awnings, clear plastic and paper window treatments. Signs for four different stores. Brass rod is included for sign attachment, but sway cables are up to the modeler. 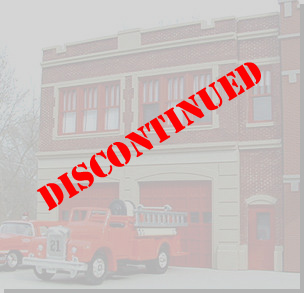 This 2-bay firehouse front comes with two types of bay doors (roll-up and bifold), an optional separate small wall with entrance door, and paper window treatments. Vehicles not included. Copyright© 1993 - 2015 DSL Shops. All rights reserved.